“Back in my day” is a phrase commonly attributed to out-of-touch old people trying to relive their former glory. But back in my day, it took balls to be good at a first person shooter. We didn’t rely on airstrikes or prepubescent teammates shouting creative curses at our opponents. It took raw skill, impeccable map memory, and an almost God-like ability to know when that gold armor would spawn again. There’s been a recent surge of game makers creating titles that hearken back to those good old days of gaming, but these are games made by Nintendo and Sega fans; naturally, their games are platformers and adventure titles. But where are the games made by people growing up with Doom, Quake, and Duke Nukem 3D? Enter Interceptor Entertainment with their remake of the classic Rise of the Triad. 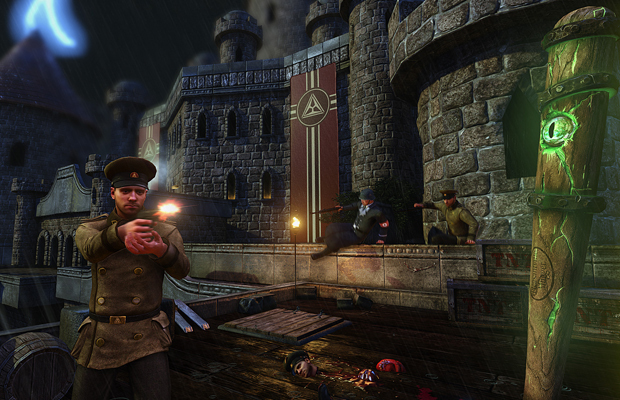 Rise of the Triad is the remake/reimagining of the 1994 original, bringing the series to modern audiences. The game still sees you playing as the special operations team H.U.N.T. (High Risk United Nations Task Force). When the squad is sent to San Nicolas Island, off the coast of southern California, to eliminate a dangerous rogue force known as the Triad, your job is to take them down at any cost. It’s your standard 90’s FPS plot, but the plot here is just an excuse to show off great level design. If you remember anything about the 90’s FPS, then you’ll remember maze-like level design, intricate switch systems, gold keys, and first-person platforming. All of those classic charms return in great form, as long as you accept the fact that a good helping of platforming, which can be frustrating as Hell thanks to an unforgiving checkpoint system, is part of your reality. A “save anywhere” function would’ve been a great addition to help alleviate the pain of failing a tricky jump. On the other hand, special attention should be paid to the level design. Rise of the Triad is essentially a corridor shooter, but its map design makes you want to explore each nook and cranny to discover every secret, of which there are many. Back in my day, the original Rise of the Triad was something of a benchmark when it came to modern PC graphics. It included new details such as bullet holes on walls, fog, breakable glass, and so many others. It makes sense, then, that this new Rise of the Triad pushes your machine to the breaking point. Interceptor has managed to modify Unreal Engine 3 to, ahem, unreal proportions. The game looks phenomenal on a high-end PC, yet it’s playable on lower-end machines. Texture streaming, a common complaint in UE3 games, is nearly nonexistent. And the game has an absurd amount of customization, too. I think it got to the point of Interceptor making up details that you can change. (What does “Shadow texels per pixel” even mean?) The lovely visuals are coupled with the bitchin’-est, most head thrashing hair metal soundtrack since Doom. Of course, one of the main draws of this game is its multiplayer mode. Featuring up to 16 combatants in five different maps, Rise of the Triad shines in reminding us how addictive simple deathmatch and capture the flag modes can be. That’s all you get at launch, though. Sure, that may pale in comparison to other shooters’ multitudes of game modes, but Rise of the Triad glows with simplistic beauty. I had an absolute blast with the game’s competitive play, even though the learning curve is pretty steep. If you haven’t played a twitch shooter in a while, you’ll want to practice. It’s just a shame that there aren’t any bots currently. While mulitplayer content may be on the low end of the scale, Interceptor is shipping out an SDK that will allow users to create mods and maps. So look for fan-made maps and mods to further extend your time with the game. Overall, Rise of the Triad is the complete package for old school FPS nuts like myself. If you’re curious about what made those games so special, Rise of the Triad is a pretty great introduction, especially considering the $15 price point, which, even back in my day, couldn’t buy you the original Doom. Rise of the Triad was developed by Interceptor Digital and published by Apogee Software. A Steam copy was provided for review purposes.